This month our Health & Wellness and Spanish Peer Support groups will be meeting on the first Friday rather than the second Friday of the month. That is they will be held on March 1st. Monthly Recurring Events At Blindness Support. *Our Meetings are invite only. Please contact us to RSVP before the meeting date. We have an Adjustment to Blindness Peer Support Group where you can come and discuss the issues you face as a person with a visual impairment. We have resources and tips to improve your independence. We have various topics and meet every second Friday of the month. This group is for people who speak Spanish. Our Health & Wellness group is designed to help the blind and visually impaired pursue a safe, healthy, and active lifestyle. Topics vary monthly and generally center around diet and exercise this event is held on the second Friday of the month. 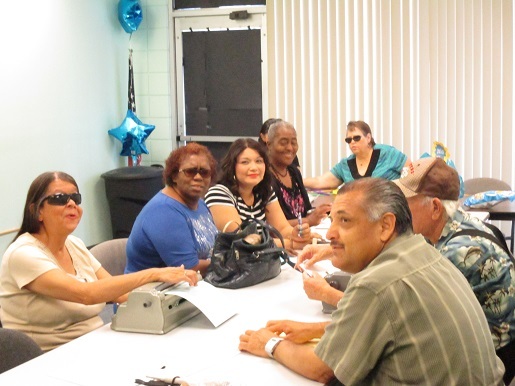 We have a Peer Support group where individuals that are blind are visually impaired can interact with others. We have various topics and activities. We meet every third Friday of the month. We discuss topics related to Apple iPhone, iPod Touch and iPad Devices and Apps followed by open discussion. It is free to our Blind patrons and do not forget to bring your iPad, iPod, or your iPhone. If you do not have an Apple Device, but would like to Join us and learn, you are welcome to come! We meet the third Friday of every month. Join us and have fun reading Braille material in uncontracted and contracted formats. Come and be a part of this club to maintain and increase the fluency of your Braille reading skills. We meet the last Friday of every month with various topics. RSVP today!